> Take part in our sgCarMart contest and stand a chance to win attractive prizes! 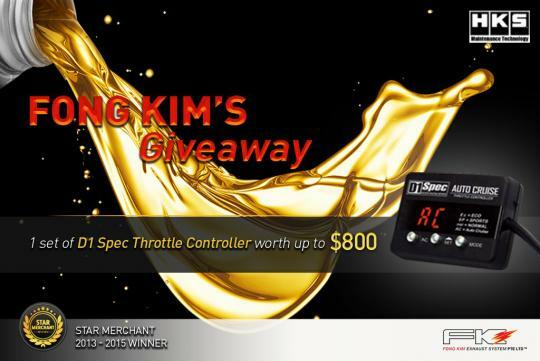 Take part in our sgCarMart contest by answering questions about Fong Kim's HKS Engine Oil in the month of January and stand a chance to win attractive prizes worth up to $800. Contest ends 31 March 2015. Also, Check out this month's latest deals & discounts. One of the best deals, promotions and discounts specially for our members that shouldn't be missed! Take control of your car loan with Citi & save on your interest. Get your pre-approved car loan now! Drink.Drank.Drunk? What ever it is, why put yourself at risk? Drink driving is a serious offence not only in Singapore but throughout the Globe. Worried getting stopped at Police road blocks or getting into accidents causing injuries or fatality? Well, we won't know what is exactly going on around us when we start getting tipsy. Singapore's best car parts and accessories online store, discount up to 40% off! Visit us now! 3-In-1 Package at only $240. Includes oil change, air con restoration, throttle and intake manifold flushing. Instant Cash For Your Scrap Car! We want your scrap car with parf eligibility! Instant cash on the spot! No need to wait for LTA refund.